“True and Wonderfull. 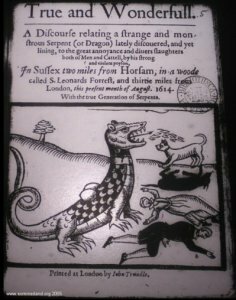 A Difcourfe relating a ftrange and monftrous Serpent (or Dragon) lately difcouered, and yet liuing, to the great annoyance and diuers flaughters both of Men and Cattell, by his ftrong and violent poyfon, In Suffex two miles from Horfam, in a woode called St. Leonards Forreft, and thirtie miles from London, this prefent month of Auguft. 1614. With the true Generation of Serpents. 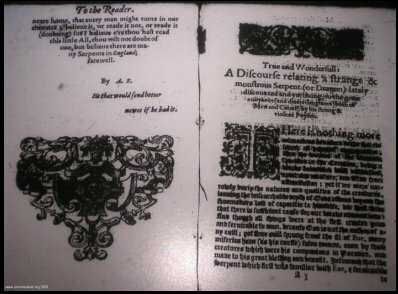 Printed at London by Iohn Trundle. …In Phrigia and Ethiopia are many Dragons, and Serpents, and there were as Auguftine affirmeth in the hollow places of the earth: and not onely in foraine and farre remote countries: but alfo in neighboring and nere adisyning nations: and firit of all there was a Serpent or winged Dragon brought unto Francis the French King: when he lay at the Sancton, by a sountry man: who had Qaine the fame Serpent with a fpade: Chifuen alfo faith that in the yeare of our Lord, 1543, there came many Serpents with feete, and winges, neare Stiria: who wounded the inhabitants ineurably. Cardan writeth that at Paris in France hee himfelfe faw certaine Serpents with winges: when the riuer Tibernuer flowed the banckes many Serpents were bifrouered. …there is difcouer’d in our neighbour Countie of Suffes, a ftrange and monftrous Serpent (a thing moft noyfome and dreadfull to the Inhabitants…It is likewife difcouered to haue large feete, but the eye may be there deceaued, for fome fuppofe that Serpents have no feete, but glide uppon certaine ribbes and fcales which both defend him from the upper part of his throat unto the lower part of his bellie, and alfo caufe them to moue much more the fafter, for fo doth this by firft drawing together then floating forth, ridsway (as we call it) as faft as a man can run. It is of countenance very proud and at the fight or hearing of men or Cattell, will raife his necke upright, and feeme to liften and looke about with great arrogancey: There are likewife on either fide of it difcouer’d two great bunches fo big as a large foote ball, and (as some thinke) will in time grow to wings, but God (I hope) in their and our affiftance will go infruct and defend us that hee fhall bee deftroy’d before hee growe fo fledge. He will caft his venome about foure rodde from him, as by woefull erperience it was proued on the bodie of a man and a woman comming that way, who afterward was found dead, being poyfon’d and very much fweld, but not prayd upon. Likewife a man going to chafe it, and as he imagin’d to deftroy it with two Daftiue Dogs, (as yet not knowing the great danger of it) his Dogs were both kild, and he himfelfe glad to returne with hact to preferue his owne life. 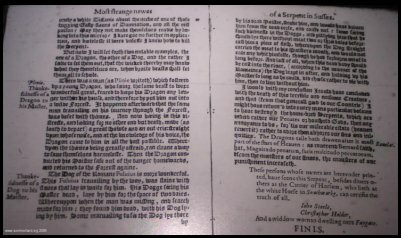 Yet this is to be noted, that neither the man or the Dogs were prayd upon, but flaine and left whole, for his food is thought moft part of it to be in a Coniewarren, which hee much frequents, and it is found much feanted impaired in the encreafe it had went to affwrd: and now fpeaking of a place it will be neceffarie for me to fhew where that place is, leaft my truth be repulft and not receiued for her felfe.